Improve the gear shift travel by up to 28% and make your FIAT 500T or ABARTH shift like a true sports car! This short shifter kit will reduce your shifter travel and really make your 500 shift like a sport car. 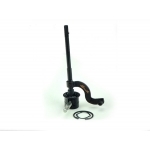 You can reuse your stock shift knob and gear shift boot, This is a true bolt in assembly that includes all the hardware you will need along with detailed instructions. All the installation is done inside your car and there is no need to get underneath the car for any of the installation. You can do this modification in your driveway with basic tools. Want to take your 500 autocrossing or simply have a better shift feel and response? This is a great upgrade over the stock shifter mechanism. Please check out our other listing for the regular Non ABARTH/ Non 500T Model.